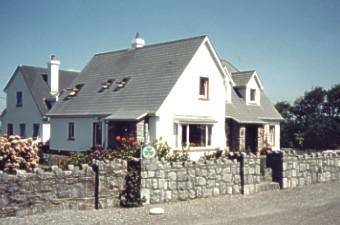 Atlantic Sunset Bed and Breakfast, B&B Holiday Accommodation / Lodgings in Doolin, Co. Clare, West Coast Ireland. "We want to move in! Just as cosy as being at home. Thankyou." A Family run and purpose built Bed and Breakfast, where a warm welcome is assured. Spacious ensuite family and double bedrooms. Bedrooms fully equiped with Tea/Coffee making facilities, hairdryer, curling iron, and alarm clock. Walking Itineries, Taxi's, Ferries, Boat hire and Restaurants organised by hosts. It is a place of great beauty and tranquillity, where the visitor can refresh their spirits away from the everyday hustle and bustle of life. For some it is the centre of music and merriment. For others it is a base from which to explore a magnificent part of Ireland. It is a paradise for geologists, botanists, ornithologist, speleologist and walkers. Just four miles south of Doolin are the majestic Cliffs of Moher, battling daily with the Atlantic ocean. They rise in places to over 700 feet. A visitor centre is open all year round. Doolin is on the fringe of the world famous Burren, a remarkable limestone area which has a combination of many visual features that make it unique in Europe. Its geology, flora, caves, archaeology and history set it apart as a place of mystery and beauty - an explorers dream. The Burren Display Centre in Kilfenora helps unravel many of the Burren's mysteries. Local activities include golf, pitch & putt, fishing, caving, walking, cycling, horseriding, surfing, scuba diving, canoeing and bird watching. Willkommen in Doolin, Irlands Beliebtestem Dorf! le Village Favori De L'Irlande!